For a year, Colt met Julia Vernon every week by the bridge near his house. Their relationship was kept secret; Julia was the most popular girl in school, and one of the richest, and Colt is no one to the rest of the rich, popular crowd on Black Mountain. But right before Colt's junior year begins, Julia is killed in a car accident, and Colt is left alone with the knowledge of what he and Julia shared. Then her brother gives Colt a journal of letters Julia wrote to him, and by working his way through Julia's documentation of the previous year, Colt struggles to confront his feelings for the girl who was never really his and attempt to keep living his life. Colt is a very personable and convincing character. His memories and narration are very vivid, yet never appear out of character. The pain and emotion he feels are palpable, but not overwhelming, and The Secret Year strikes just the right balance between the grief, thought, and memories Colt experiences and the mundane aspects of everyday life. Colt's ever-evolving and confusing feelings are very well played out, and they are almost suspenseful in that it is hard to predict what Colt will do next, or what exactly he is feeling, until he experiences the moment for himself. Colt isn't the only well-written character--the entire cast of supporting characters, from Colt's circle of friends and his good friend Syd to his family (his brother Tom is especially interesting and entertaining) to Julia, who is always alive through memories and her journal, are all multi faceted and intriguing. They all help the reader understand the world that is Black Mountain and the flats and the vast differences between the two. The war between social classes played out in a high school setting is certainly not a unique premise, but Hubbard does an excellent job at keeping it fresh in her novel by drawing the reader into the drama and showing how it relates to Colt’s past, present, and even future. Overall, The Secret Year is a beautifully written and authentic read. Readers will be hypnotized by Colt's story; it's not hard to feel sympathetic toward him as he struggles to deal with his grief and isolation, and you won't be able to help but be proud of him when he learns and grows. This is one tension-filled, romantic (but not overly sappy) novel. I've got my eye on Hubbard! Cover Comments: As a girl, I like the black background and the couple kissing. I think it fits the story quite well. However, as a more objective reader, I can't help but think that the swirly font and kissing couple will turn off certain male readers. It'll be hard to sell such a romantic cover to a guy, despite the excellent male narrative. Nonetheless, this is a very nice cover. 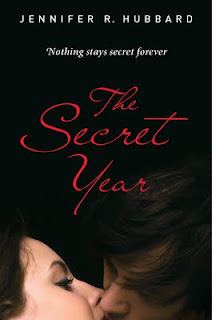 The Secret Year is out today! I think Julia was my favorite character in this book! I like how layered she was...she was never what I expected.